Immaculate home in the heart of Lemont blends vintage character and charm with modern amenities. 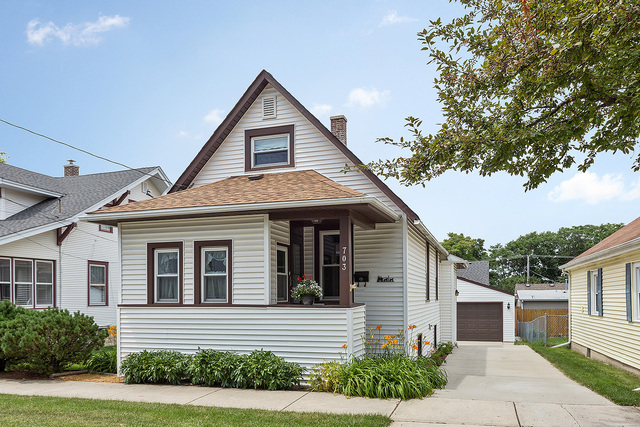 Beautiful home features 2 BR, 2 updated baths, 1st floor office and a full finished basement. Welcoming, enclosed front porch greets you before you enter the large living room with hardwood floors and an abundance of natural light. Charming modern kitchen with great cabinet and counter space, enormous eating area surrounded by windows overlooks the lush backyard. Second floor bedroom with sitting area and great closet space. Full finished basement with a large family room, exercise area, full bath, laundry room, workshop area and wine cellar! 2.5 car garage and concrete driveway approx. 6 years old. All major items have been replaced since 2005: roof, siding, gutters, driveway, garage, windows, furnace, A/C and water heater. Prime location with easy access to expressways, METRA, downtown Lemont, schools/parks. ESTATE sale. Good condition but sold as-is.